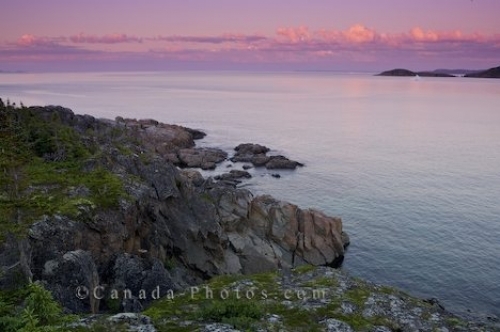 Along the Ocean View Trail in the town of Fleur de Lys in Newfoundland, Canada, pink hues take over the sky at sunset. The coastal scenery along the Ocean View Trail near the town of Fleur de Lys in Newfoundland, Canada is stunning at sunset. The clouds across the horizon are shaded in pink hues as the pink lighting reflects off the surface of the calm water. Coastal scenery seen from the viewpoint of the Ocean View Trail during sunset in the town of Fleur de Lys, Dorset Trail, Highway 410, Baie Verte Peninsula, Newfoundland, Newfoundland Labrador, Canada. Picture of the pink hues highlighting the sky at sunset near the town of Fleur de Lys in Newfoundland, Canada.